The first Doughnut Day of 2014 turned out to be a great success and we were very lucky in being able to use the field. The rain on Wednesday started several hours earlier than forecast and also stopped earlier and so we had several hours of a brisk breeze and no rain. The field improved as the day went on. By the time we arrived on Thursday morning we had a good look at the field and although there were areas that were soft we also found a good firm area to launch from and also a good place to land. We were able to retrieve alongside the peri-track and so flew all day without any problems or damage to the field. The only drawback was we had to do a single tow out for each launch as we could not drive directly down the field to the launch point. The weather was kind to us with the Westerly wind slightly less than forecast at about 15 – 20 kts for most of the morning and then decreasing during the afternoon, The sun shone all day with no showers or rain although it was a cold wind as the upper wind was slightly from the North. In the end we flew until we lost the light just using the 3 x K13’s. Longest flights…………….11 mins. 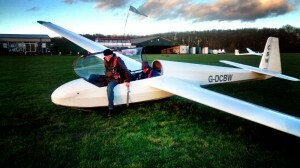 Well done to Tony M. and Phil Pa.
Average Flight Time……….7 mins. (including one cable break, well done Ken). Flight Time for Day………..Just under 3 hours. 16 Members on the flying list when we started flying and it was good to see Humphrey and Neil back at the club after their brush with the N.H.S. last year. A really good start to 2014. 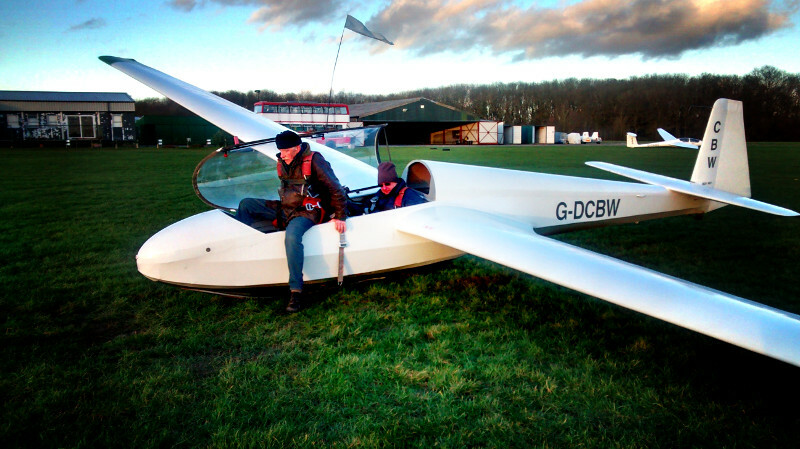 This entry was posted in Flying reports and tagged 2014. flying report, midweek by Steve P. Bookmark the permalink.